Limited to 20 travelers - and likely to sell out! 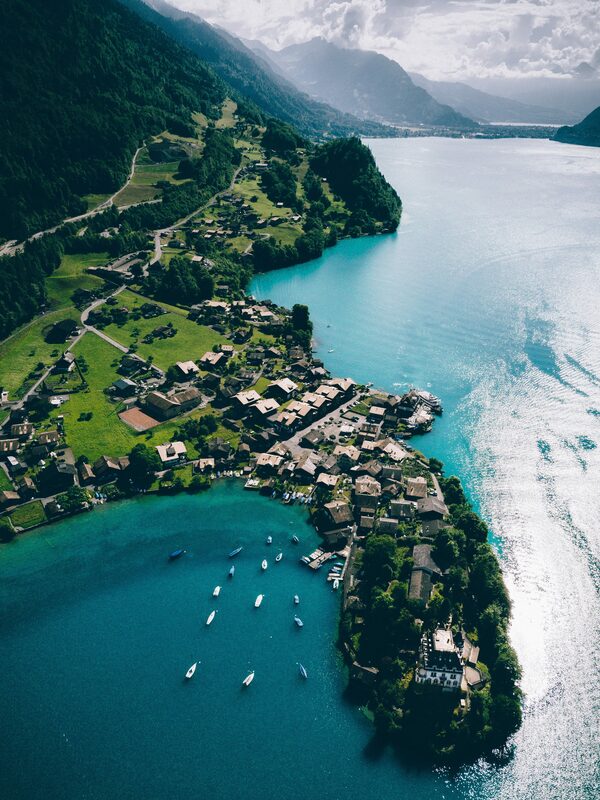 You never knew this Switzerland existed. Above you is the sheer rock face of the cloud-scratching Alpine peaks you climbed yesterday. Now you’re in the valley, lit by a deep indigo sky. There are no crowds here – only ringing cowbells somewhere far below and the smoky aroma of grilling meats wafting over the meadows and wildflowers. 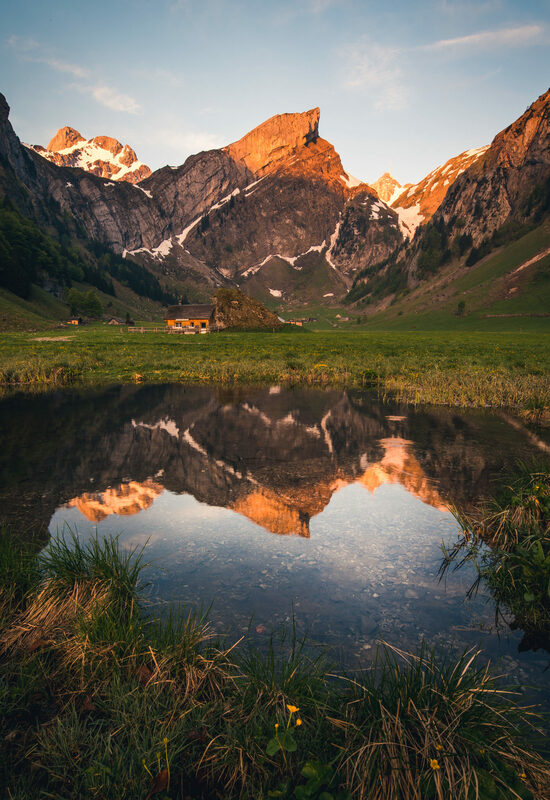 This is Appenzell Innerrhoden, a remote corner of Switzerland’s least populated canton and a place where age-old traditions thrive. You’re standing still to take it in, and you know you’ll never see Switzerland the same way again. 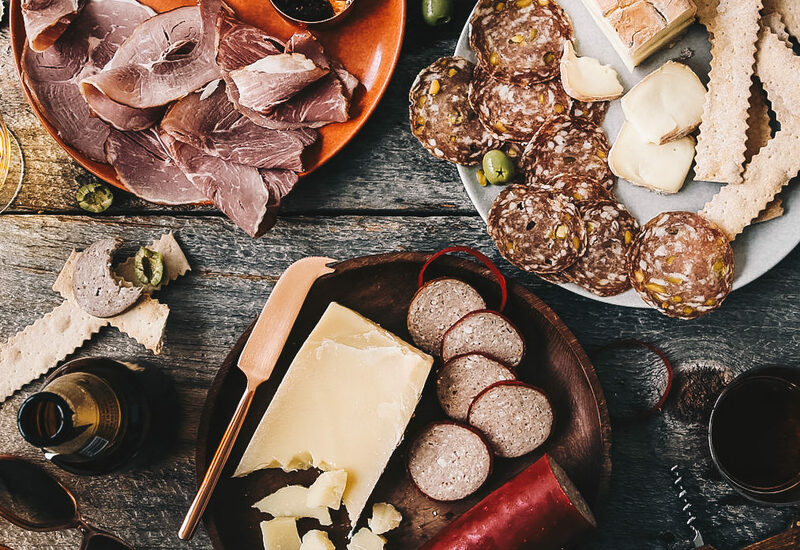 Your companion on this incredible seven-day journey is Elias Cairo, the mastermind behind Portland’s iconic Olympia Provisions, and one of the region’s – or maybe the world’s – top charcuterie experts. An endlessly curious thinker and traveler, Elias is taking us with him on a greatest-hits grand tour of the mountain inns, restaurants, artisanal workshops where he once apprenticed, places where generations of knowledge and painstaking precision go into every slice of cured meat. 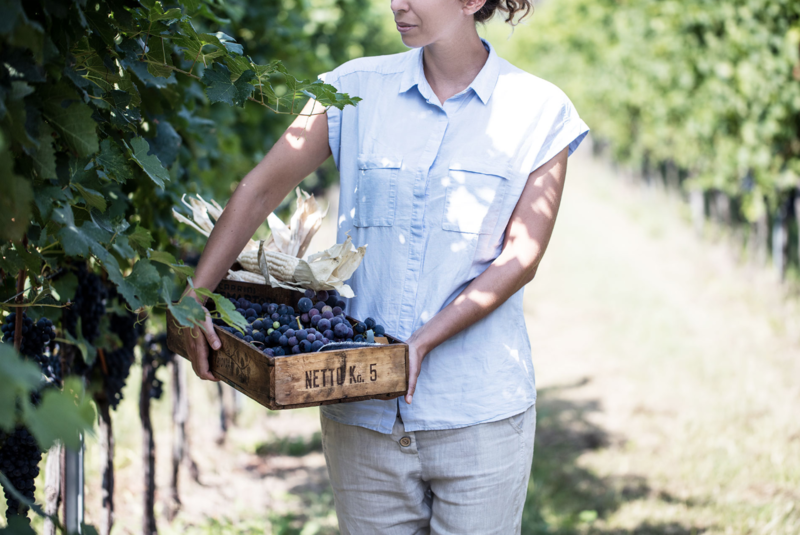 Also with us is Jessica Hereth – Olympia Provisions’ sommelier, and one of Food & Wine‘s 2018 Sommeliers of the Year – introducing us to one of the world’s proudest, most overlooked wine-growing regions. 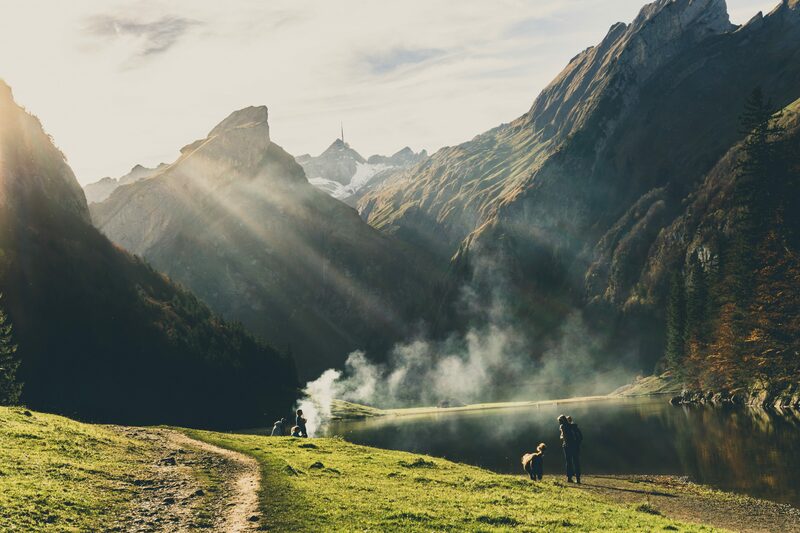 This Swiss journey is for you if you relish the idea of celebrating the ancient wisdom of curing meats, scaling mountains for breathtaking accommodations, and journeying through an ever-changing cultural and scenic landscape. 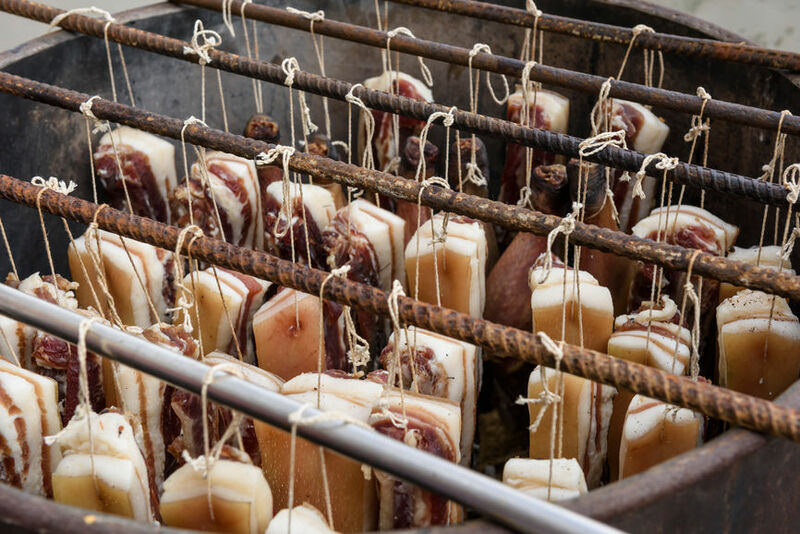 We’ll go back to the roots of one of the world’s charcuterie experts to epically hike, eat and drink. Join us! A gentle hunter with a heart of gold, Elias is the sly genius behind all of your favorite charcuterie. His passion for meat began at a tender age, learning how to craft meat by his father’s side and mastered during his apprenticeship in the Swiss Alps, under Swiss master chef Annegret Schlumpf. In 2009 Elias opened Portland’s iconic Olympia Provisions; today Elias is one of the top charcuterie experts in the Pacific Northwest. He’s been a hunter, provider and friend of the land ever since, the kind of man that reveres every piece of meat he touches. No shortcuts here. Elias believes that the finest meats come with love, care and respect for the animal. He’s also the keeper of highly prized salumist secrets, bringing old world techniques to the craft of modern charcuterie. Elias wants to know it all - from understanding the nuances of how to hunt, butcher and prepare an animal to experimenting with new curing techniques. Every idea is a potential lesson waiting to be explored. It’s a lifelong pursuit of knowledge we can’t help but admire. Elias has been just about everywhere. He's led the adventurous kind of life that lends itself to gripping stories. His experiences shape his character as an artisan, and make him the kind of guy we love to share a pint with. Switzerland with Elias Cairo is a journey back to his roots. We'll scour the country from soaring Alpine mountaintop to rolling vineyard to shimmering lake for the best food and drink, the clearest air, the most delicate wines rarely tasted anywhere else in the world. Grüazi and welcome to Switzerland! From our meeting point in Zurich this morning, it’s off to Switzerland’s remote northwest corner, in Wasserauen, for a jaw-dropping cable car ride up to Ebenalp. As our carriage gently rocks its way 2,500 feet upward, the rolling hills give way to craggy Alpine rock formations and cavernous valleys. After a short walk through the majestic Wildkirchli caves (where hunter-gatherers lived some 40,000 years ago), we’ll continue along a rock face to an unforgettable scene: the famous Berggasthaus Aescher. It’s a 170-year-old guesthouse hewn out of the side of a cliff. In the evening, enjoy a welcome dinner with our group to get acquainted before our adventure ahead. 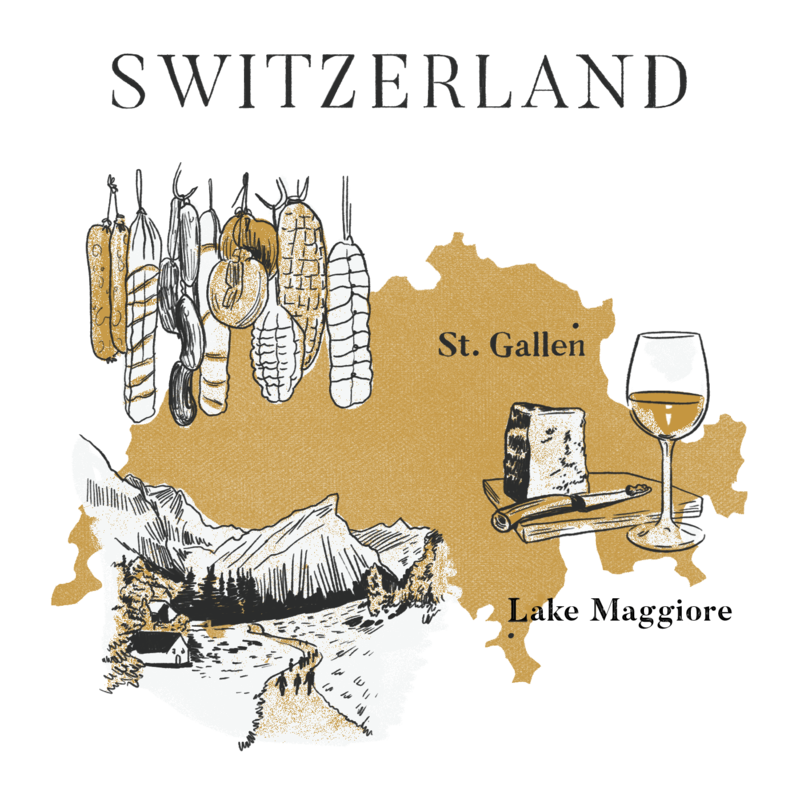 After a hearty breakfast at our hotel, we’ll get down to business, meeting with local producers to learn all about the region’s famous cheese and St. Gallen veal sausage (always eaten without mustard) from local farmers, hunters, and other artisans. 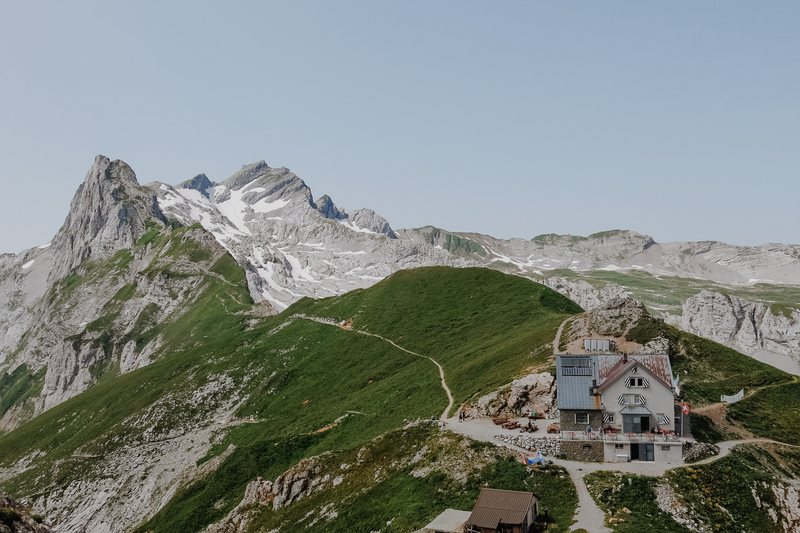 After sampling all we possibly can, we’ll return to Wasserauen to grab our overnight packs and head into the mountains for an Ufälaufe — hiking past the turquoise waters of the Seealpsee and the half-timbered farmhouses of Meglisap to reach the majestic Rotsteinpass. We’ll overnight at a mountain inn courtesy of our fourth-generation hosts, who will treat us to an unforgettable traditional dinner. After heading back down the mountain to Wasserauen, we’ll stop for lunch at the Alpenrose, where Elias first apprenticed when he came to Switzerland. Next is the village of Parpan, where the Brugger family has been creating some of the world’s finest cured meat for over a century. After our visit, we’ll roll up our sleeves and pitch in to prepare some of the region’s classic hunting dishes. 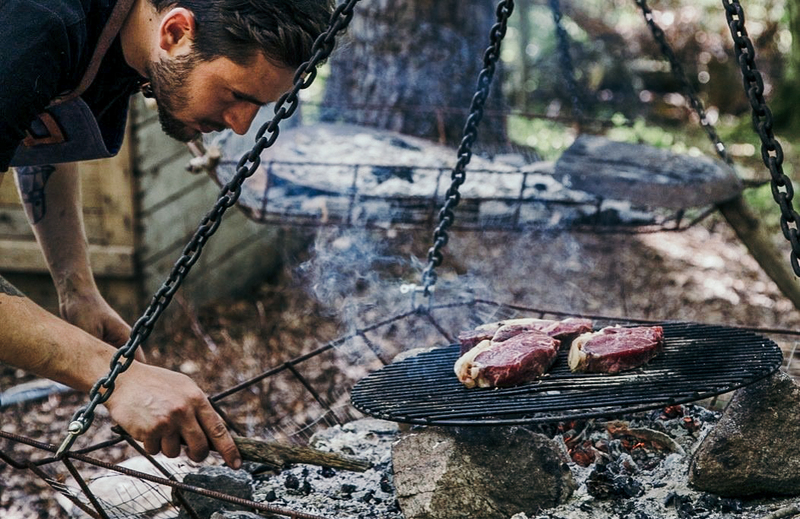 We’ll help Elias and our hosts create this once-in-a-lifetime meal on our own Schwenkermeister, a classic Schwenker grill suspended over a beechwood fire. After cooking and celebrating, we’ll tumble into bed in our very own 300-year-old barn (complete with modern amenities, roaring fireplaces and skylights for star-gazing). Today we leave this part of Switzerland to go south. It feels like a new country, where Italian is the local language. 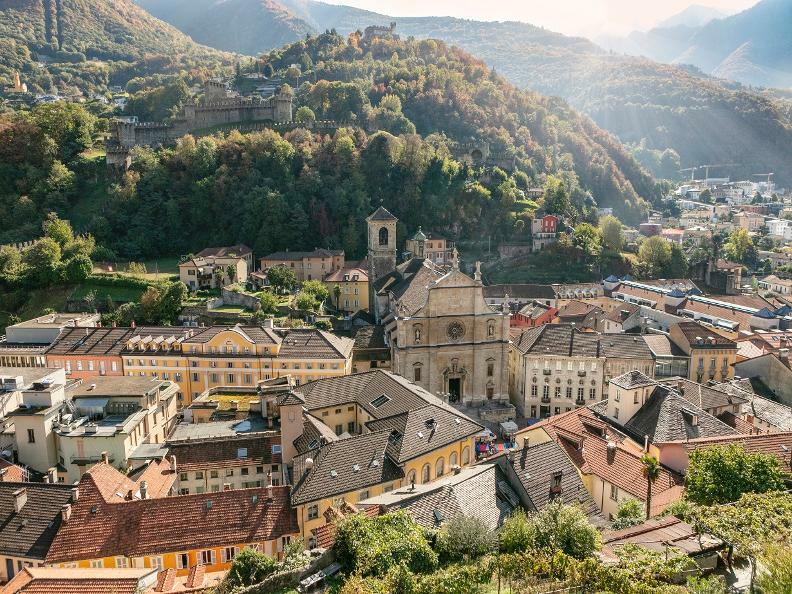 First we’ll pass through the majestic Graubunden mountains and over the famed Maloja Pass, a serpentine route that’s the star of the recent Juliette Binoche film Clouds of Sils Maria, before descending toward Lake Como, the traditional, beloved watering hole of glitterati from Lord Byron to George Clooney. 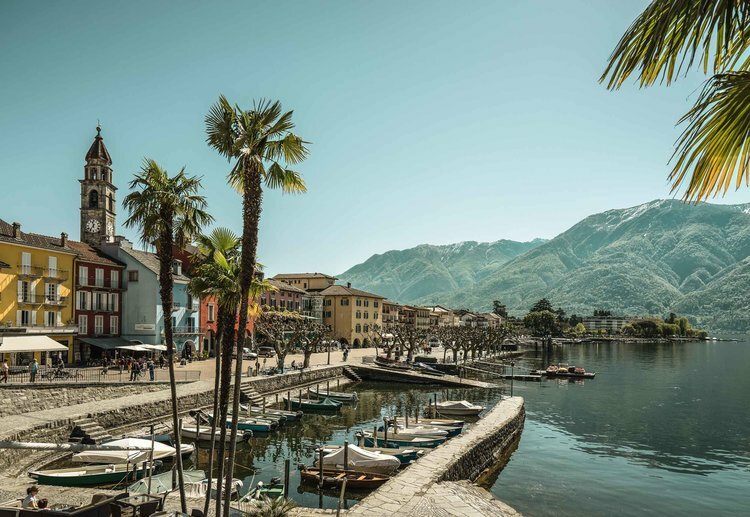 We’ll stop for tastings and visits along the way before arriving in languid Ascona, whose pastel-colored houses, bright row boats, and breezy palm trees hug the northern shore of placid Lake Langen (Maggiore). Tonight is ours to relax, take a passeggiata along the lakefront with the locals, and admire the sunset as it melts into the water. After breakfast on the terrace, we’ll head to the Vallemaggia, the aptly named ’magic valley’ where villages of stone houses perch over grottoes, and arched stone bridges span cascading rivers. We’ll explore a few of its villages and sit down for a traditional lunch before visiting Terreni Alla Maggia, an ecological farm famed for its fields, orchards, and vineyards—and above all for its Bondola grapes, an ancient, dark-skinned varietal indigenous to Ticino. We’ll be introduced to local producers and their wine-making techniques. Olympia Provisions’ sommelier Jessica Hereth will take the lead here, guiding us through a degustazione. Then it’s back to Ascona in time for an aperitivo and dinner at one of those beautiful restaurants ringing the lake. This morning we’ll head to nearby Bellinzona for its weekly market, a beloved Saturday tradition since the Middle Ages. As we poke our heads under the colorfully canopied stalls lining the crooked streets of the Old Town, we’ll sample regional cured meats, aged alpine cheeses, and the special pane del mercato (leftover bread soaked in milk and eggs and baked with dried fruit and nuts), as well as marmalades, chestnut honey, and marrons glacés. Afterwards, we’ll explore the sedate merchants’ houses, stone gateways, and wrought-iron balconies of the Old Town. 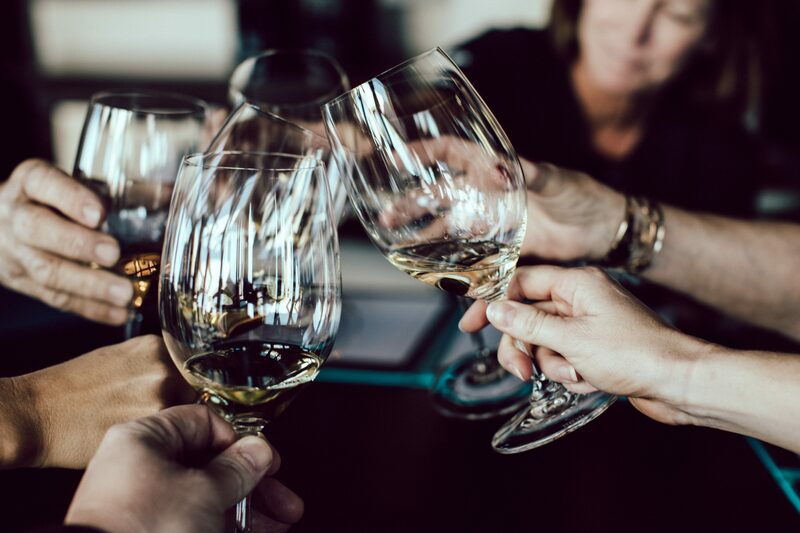 Back in Ascona, we’ll have time for a lakeside aperitivo before gathering for our final feast, a multi-course dinner featuring some of the delicacies we’ve come to know and love over the past week. After a final lakeside breakfast, we’ll bid addio and widerluege to Elias, Jessica, Switzerland, and each other before heading back to the Zurich airport via private transfer. Famous for efficiency and design, Switzerland spares nothing with accommodations. Whether we're staying in an ancient farmhouse, a cozy mountain inn, or a lakeside palazzo, we'll feel exquisitely taken care of, and exquisitely at home. 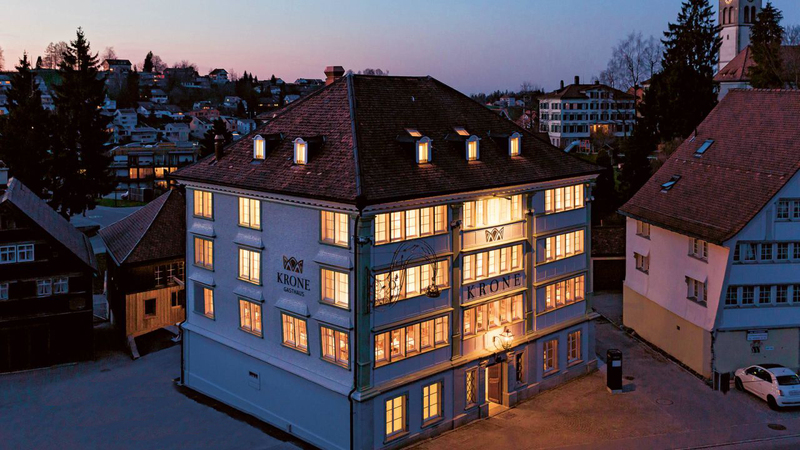 This boutique hotel in the Appenzell region has just twelve modern rooms, and packs plenty of charm, comfort and inspiration into each one. The unique architectural details laced through each room, like intricate angular ceilings and sloping stone alcoves, mirror the vast countryside right outside the door. 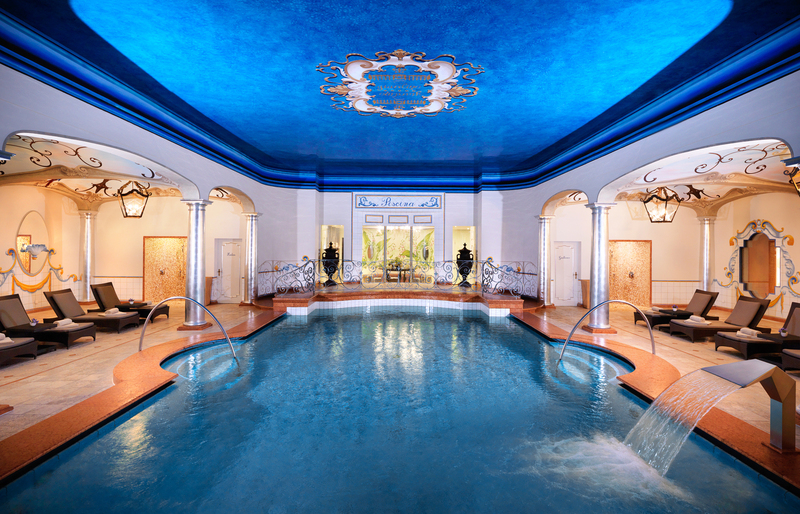 What's the only thing more gemütlich and cheerful than a Swiss guesthouse? A Swiss mountain guesthouse! 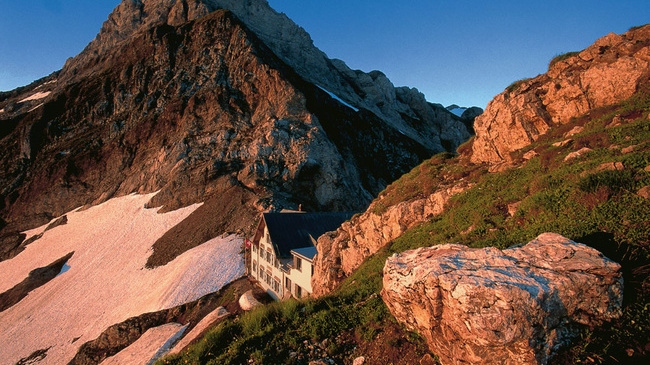 Built in 1934 and now lovingly stewarded by a fourth-generation innkeeper, Berggasthaus Rotsteinpass is mountain aerie only accessible by hiking trail, soaring 7,000 feet above sea level on the transition from Appenzellerland to Toggenburg. To sleep here is to slumber carefree above the clouds, like a god or goddess. 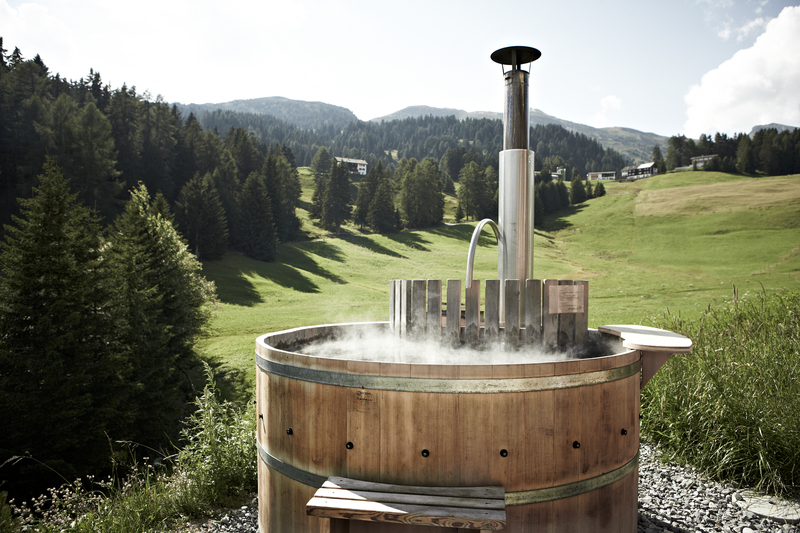 "Roughing it" takes on a whole new meaning at this design-forward hotel in the hamlet of Sporz, where each 300-year-old hut or barn is equipped with exactly the amenities you need (a roaring fireplace, a bathtub with views of the nighttime sky, a cigar lounge) while still offering a truly rustic respite from the world. Located where the Alps meet the lemon trees, this carefree retreat along the shores of Lake Maggiore sings with dolce vita. Its balconies and terraces offer sprawling views of the lake below. Strolling the gardens, sipping a caffè on the verandah, or taking a gentle boat ride around the lake, you'll understand exactly why George Clooney has made this part of the world his home away from home. Six nights at unique four-and five-star accommodations; private travel for all day trips and excursions; departure airport transfer; exclusive VIP access and tastings; private tours with local guides and cultural experts; guided activities, adventures and expeditions; entrance fees; daily breakfasts, most lunches and dinners; local beverages with meals; gratuities for local staff. International roundtrip airfare; travel insurance; transportation to the trip’s starting point; activities not included in the trip itinerary; hotel incidentals including room service, laundry service and hotel bar tabs; food and beverage not included in itinerary; gratuity for tour leader. We recommend you arrive at the Zurich Airport (ZRH) in Zurich, Switzerland on or before Sunday, August 11, 2019. You must be at the meeting spot in Zurich the next morning at 8am on August 12, 2019. On the last day of this adventure, we will take a complimentary private group transfer to ZRH in the morning, arriving approximately by 2pm. Your flight home should depart at 4pm or later on August 18, 2019. This trip is led by an expert Modern Adventure Trip Leader. They are an experienced travel guide, a representative of Modern Adventure and the person to go to with questions or concerns on the trip. We’ll be joined throughout our adventure by local, expert guides who are deeply knowledgeable with respect to local cultures, customs and history and are passionate about sharing that with us. We’ll also be joined by special guest Elias Cairo. Do I need to pay a solo traveler supplment? Yes, there is a $1,500 supplement for solo travelers, to be paid at the time of booking to secure a private room during the adventure. If you would like Modern Adventure to pair you with a roommate, that option may be available upon checkout – these spots are limited and available on a first-come, first-serve basis (See our Terms and Conditions for full details). US citizens are not required to have a visa for tourist visits to Switzerland for visits under 90 days, however are required to show a valid US passport. It is recommended that your passport is valid for six months after your travels are over. You may cancel on or before June 12, 2019 and receive a full refund minus a $500 per-person service fee. If you cancel between June 13 and July 17, 2019, there is a 50% cancellation fee. On or after July 18, 2019 there is a 100% cancellation fee. We highly recommend purchasing travel insurance as we are not able to make exceptions to this policy in cases family/medical emergency or cases of the trip being cancelled (See our Terms and Conditions for full details).